Again, the first band was one I wanted to see since two of the performers are neighbors in the Milwaukee area. Vocalist Kassandra Novell and husband Chad from Mercy Isle had begun the band in Wisconsin but ended up looking for a new guitarist and drummer after a short tour last year. Since keyboardist Joop de Rooij is from the Netherlands, it was decided that he would look for people local to him who were going to be available for MFVF and future endeavors. He found them—Sebas Honing provided guest guitars on their album “Undying Fire,” while Ywe van der Pol joined them permanently on drums. 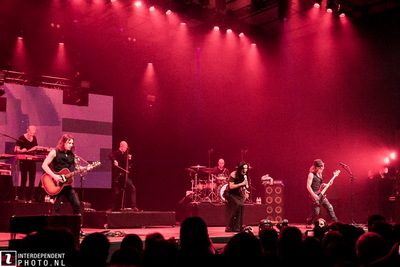 Just before the release of their album, they announced two permanent guitarists Freek Gielen and Eelco Slont who would also join them at MFVF. It’s interesting to consider that “Undying Fire,” which has drawn rave re-views, was put together while the band was on different continents. And, they had never met as a full team before getting together less than a week before MFVF. So, obviously, this was the first performance for the band, at least in this format. And the performance, like the release, drew rave reviews, something I researched during the day. Kassandra had done some interesting things with her hair, but, for me, this was still the killer voice I’d been enjoying for some time in Southern Wisconsin. And Chad continues to be one of the finest musicians I’ve been privileged to hear over the past several years. As everyone commented, a first class, very professional performance. As a side note, they had two guests join them during their set. 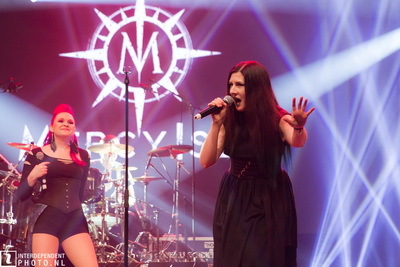 Their opening song “Wake Up” featured Thanos Murikka (Enemy of Reality) on death vocals, and their closing song “Come to Me” featured Lindsay Schoolcraft (Cradle of Filth). Skarlett Riot followed, an English band that was quite familiar to the rather large group of English guys who put in diligent time at the beer line in the VIP lounge. It was new material to me but I have to admit they put on a fine performance with a mainly hard metal approach to things. But, the third band was the band I had traveled over 3000 miles to see. Blackthorn has long been the most interesting band in the genre for me and this was the performance I was most interested in. Aina and the girls came out in dark dresses, well, mostly, and they killed it with their brand of Russian witchcraft. I pretty much know every song they’ve ever done so the material was familiar. What wasn't familiar was the strength of Aina’s voice. She sounds very good in recorded material, but, it was clear to me that recorded material didn’t begin to capture the voice. I was able to spend time with them after-wards but, it seemed everyone else had the same idea so our time was limited. But, it was a performance I will long remember. Next up was Feridea, another band from Northern Europe. The band has had a number of vocalists but the current singer, Katra Solopuro, seems to fit the sound rather nicely. The band does a brand of Symphonic metal, the kind we often get from Northern Europe and they did a first rate presentation. Much of the music was from their 2015 release Into a New Dawn. Following their performance, we saw a lot of Katra backstage in the VIP area, she was hard to miss. Following Feridea was another band I really wanted to see. I’ve worked with Whyzdom doing reviews, interviews, etc. since their first EP a number of years ago and have gotten to know Vynce Leff a little over the years. His work is some of the finest in the genre IMO. There have been a few vocalists but the band seems to have settled on the current lovely lady, Marie Mac Leod, and she is a treasure. Marie just delivered her first child recently and that can sometimes have an effect on the performance. Not this time. 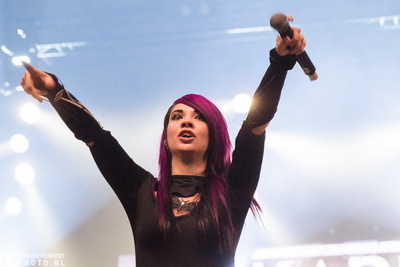 Marie, like most of the Whyzdom vocalists, is a performer as well as a singer. And, she and the band were joined on stage by a 4 woman choir to increase the value of the performance. I’ve always loved their work and have a copy of their recent live DVD. Now, I have the added experience of having seen them live. They were everything I expected and more. 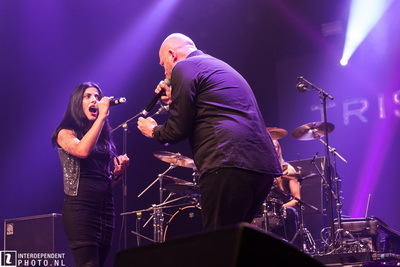 Enemy of Reality is a band with a solid history of performance at MFVF, even if some of it is just with vocalist Iliana Tsakiraki. But, Iliana is one of the most popular, and talented vocalists in the genre and has been for a while now. Her Greek band is solid in every respect and played material from several releases. 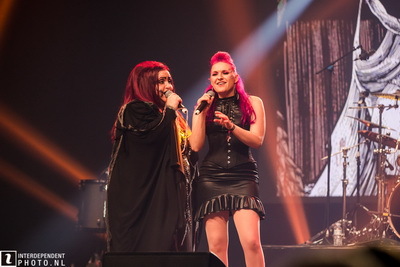 And, they were joined on stage by guests that made the performance even more interesting (Maxi Nil of Jaded Star, Mike LePond of Symphony X, Chiara Malvestiti of Therion, and Kassandra Novell of Mercy Isle). SC will be working with Iliana on a review of their latest in the near future, stay tuned. Tristania is certainly one of the longest running bands in the Femme Metal genre. This version lists Mariangela Demurtas as their vocalist and she’s a good one. Gotta be given the one she re-placed some time ago. Anyway, the band put on a performance to remind everyone that they continue to be one of the premier events in this style of music. As I recall, there may have been guests but, the solid metal and the killer vocal were the highlights of this performance. Liv Kristine next took the stage. Liv is one of the longest running acts in Femme Metal as well and she’s been to MFVF as many times as anyone. I don’t get to see a lot of these acts in person but I think I’ve seen Liv as much as anyone. She’s been in the news lately, not all of it happy information, but she is a true professional. She did some old material, she did some new. But, unless you were familiar with both, it was hard to say which was better. She always sounds good, she always puts on a great show, and the crowd acknowledged her performance accordingly. What a woman. 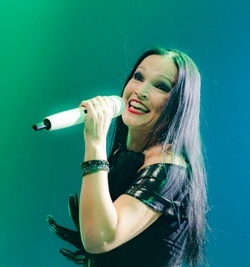 The final act at MFVF 13, again, was the one and only Tarja. This certainly wasn’t her first time on this stage, I have posters here at home from the very earliest MFVF festivals where she was the headliner, with a band from Finland as I recall. But, she, like Liv, is the consummate per-former. I heard her a couple years ago here and I have to say, her material has improved to the point that she was, IMO, the hit of the weekend, or at least one of the top 2 or 3. And, having recently seen that band from Finland she once performed with, I have to say her new material, and band, are on a par with that band at least. Sometimes you just have to put the camera down and watch and that’s pretty much what I did towards the end of the performance. So, that was MFVF 13. A little different format at least for the first evening, but the same solid 3 days of Femme Metal. You may have had different bands and performers but the talent was every bit as good as they all seem to be. And, you again had people you only tend to see once a year, and you welcome that time every year, both for the music and the friendship. The beer was good, maybe a little too good the first couple nights, but the party was first rate. As we gathered at the Tower bar after the final night it was sad to know it was all coming to an end, at least for this year. I stayed at it until about 4 in the morning, long after saying good night to Vynce and Marie from Whyzdom. Of course, recent news from Helcanen Val and the MFVF troop has put a slightly less positive spin on the future of the event. Val recently posted that MFVF was “on hold”. Not sure exactly what that means but I suspect next year is out (Which has since been confirmed). After that it’s anyone’s guess. These events are difficult to pull off, they’re expensive and putting it all together is exhausting. Val’s been at it now for some time and clearly wants some time off. How long? No one knows. But, musically, this has been a highlight of my life, and others I suspect, feel the same way. Maybe we’ve seen the last of Oktoberhallen, maybe this was it. But, never say never. For this style of music, this has been the big one. One can only be positive, and remember the great times and friendships made. They’re worth a lot.